Much if not most of what must happen in order for this crisis not to become a permanent sore and even perhaps lead to a new and mutually self-defeating Cold War (though one which, most likely, we would “win” once again, but at what cost?) lies with Russia, and not just Russian President Vladimir Putin. He is the symbol and much of the substance of what Russia is doing. Part of [President George H.W.] Bush’s vision was that Russia, the big piece that emerged from the wreckage of the Soviet Union, must not be treated like Germany at Versailles. But Putin did not just emerge fully armed from the forehead of Zeus: he is a product of a lot of factors, most of which, perhaps, have been internal to Russia, but at least some of which have had to do with the way in which many, or even most, Russians feel themselves to have been treated by the West, and especially by the United States, in much of the period since the end of the Cold War and the collapse of the Soviet Union in 1991.
which for this discussion are: to take Central Europe off the geopolitical chessboard, notably through the Partnership for Peace (PFP) and Euro-Atlantic Partnership Council (EAPC) and, for some of these countries, alliance membership; to keep the door to engagement with the outside world wide open to Russia, which included invitations for Russia to join the PFP and the EAPC, plus conclusion of the 1997 NATO-Russia Founding Act, which included some selfdenying NATO ordinances and a forum that is now the NATO-Russia Council; and to provide Ukraine with a special status pending developments with Russia, e.g., PFP, EAPC, and the NATO-Ukraine Charter and Commission. The first round of NATO enlargement was designed to help stabilize Central Europe for everyone, and thus focused on Poland and the Czech Republic, with Hungary thrown in for good measure. With the peacekeeping forces in Bosnia (IFOR and SFOR), Russia was included and, indeed, sent its top-flight military personnel who worked effectively, especially with the U.S., its great power partner, as opposed to just being one of a number of countries within NATO. Would the course of events and Russian behavior have been different if the Bush vision had been scrupulously pursued? This is an unanswerable question. in such a course; but it is not too early to begin crafting such an approach. It will not even be possible to reach a point where this alternative for the future of all of Europe can even be considered unless we—and Russia—fully recognize that no one can be the net gainer unless the current crisis is kept from hardening into a new, permanent confrontation, of whatever form. For us in the United States (less so in much of Europe), that may be the hardest task of all: to keep from trotting out the emotional and psychological apparatus of the Cold War. These proclivities are easy to turn on; but as we have found so often in our history, they are far harder to turn off, short of capitulation by a defined enemy. The West does have to respond to Putin’s seizure of Crimea and threats to the rest of Ukraine, which, among other things, violate the 1975 Helsinki Final Act and the 2004 Budapest Memorandum. The U.S. and its allies have to take military and other steps to reassure anxious allies in Central Europe that NATO membership means what it says. require an honest assessment of what went wrong from about the late-1990s onward—wrong in the West, especially the U.S., and wrong in Russia. It includes not abandoning, certainly not ab initio, the effort to move beyond the old and discredited balance of power approach to security in Europe, along with the notion of spheres of interest. Maybe Putin’s Russia—or post-Putin Russia—will not be able and willing to proceed on this basis, now or later. But the three basic post-Cold War Western goals still objectively form the best basis for a European future that will be in the interests of all its members and, if done right, will not detract from the legitimate requirements of any of them. If we do all that, then the practical steps can be worked out, in time with Russia and everyone else, not on the basis of excluding any country. Goals and strategy must come first; tactics can only come second. 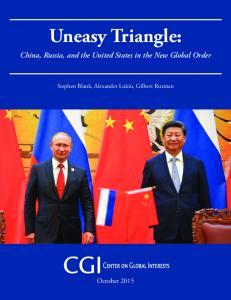 This effort has to begin, both in the U.S. and allied and partner governments and in the Western research community, with developing approaches that deal with realities and shared requirements of political, security, and economic relationships, and including Russia—if it will in time play, and play by rules it helps to write. Then these approaches could in time have a chance of mutually beneficial success. Report "Russia and the new New World Order"